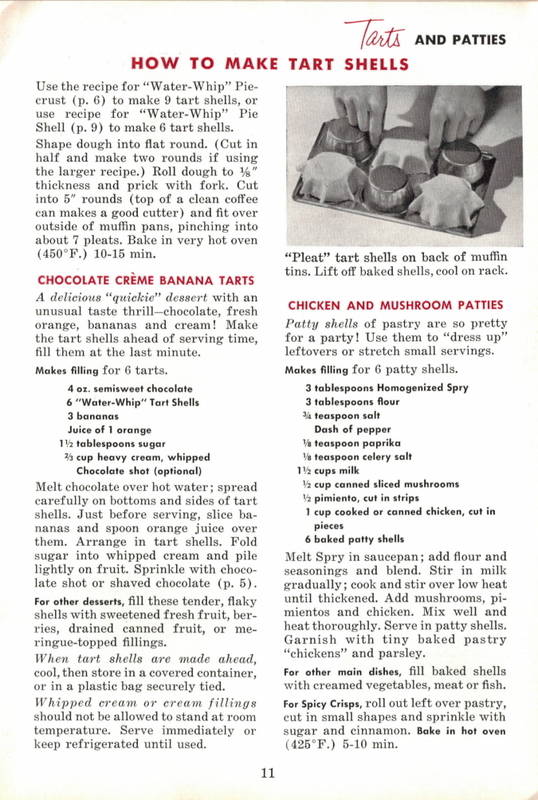 Here is page 11 of the vintage cookbook: Home Baking Made Easy that was published in 1953 by Lever Brothers Company. Use the recipe for “Water-Whip” Piecrust (p. 6) to make 9 tart shells, or use recipe for “Water-Whip” Pie Shell (p. 9) to make 6 tart shells. Shape dough into flat round. 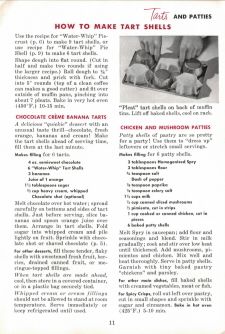 (Cut in half and make two rounds if using the larger recipe.) Roll dough to 1/8″ thickness and prick with fork. Cut into 5″ rounds (top of a clean coffee can makes a good cutter) and fit over outside of muffin pans, pinching into about 7 pleats. Bake in very hot oven (450° F.) 10-15 min. A delicious “quickie” dessert with an unusual taste thrill–chocolate, fresh orange, bananas and cream! Make the tart shells ahead of serving time, fill them at the last minute. Makes filling for 6 tarts. Melt chocolate over hot water; spread carefully on bottoms and sides of tart shells. Just before serving, slice bananas and spoon orange juice over them. Arrange in tart shells. Fold sugar into whipped cream and pile lightly on fruit. Sprinkle with chocolate shot or shaved chocolate (p. 5). For other desserts, fill these tender, flaky shells with sweetened fresh fruit, berries, drained canned fruit, or meringue-topped fillings. 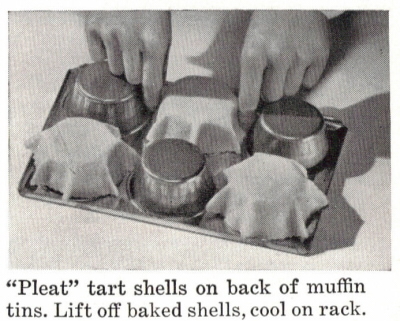 When tart shells are made ahead, cool, then store in a covered container, or in a plastic bag securely tied. Whipped cream or cream fillings should not be allowed to stand at room temperature. Serve immediately or keep refrigerated until used. Patty shells of pastry are so pretty for a party! Use them to “dress up” leftovers or stretch small servings. Makes filling for 6 patty shells. Melt Spry in saucepan; add flour and seasonings and blend. Stir in milk gradually; cook and stir over low heat until thickened. Add mushrooms, pimientos and chicken. Mix well and heat thoroughly. Serve in patty shells. Garnish with tiny baked pastry “chickens” and parsley. For other main dishes, fill baked shells with creamed vegetables, meat or fish. For Spicy Crisps, roll out left over pastry, cut in small shapes and sprinkle with sugar and cinnamon. Bake in hot oven (425° F.) 5-10 min.